So much for Major League Baseball's attempts to speed up the pace of games this season. The Red Sox drew first blood in their weekend series against the Yankees with a 6-5 win in 19 innings over New York in the Bronx on Friday night, a game that took nearly 7 hours to complete. 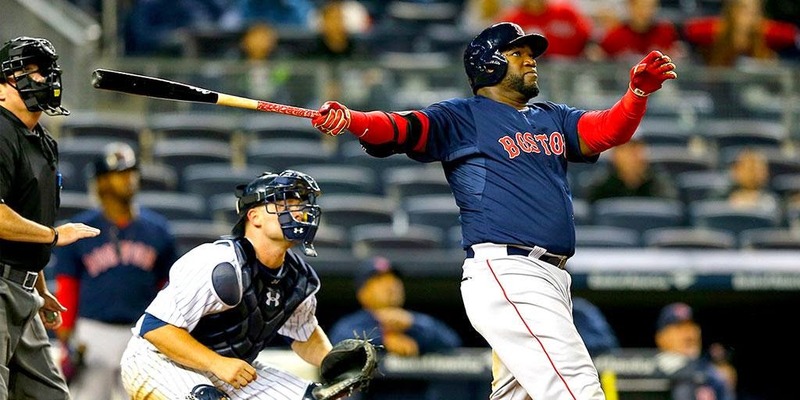 With the game tied a 3 in the top of the 16th inning, David Ortiz's first home run of the season (pictured) gave Boston a 4-3 lead, which disappeared in the bottom of the inning on Mark Teixeira's solo blast to left. The teams traded runs again in the 18th - an RBI single by Pablo Sandoval countered by a Carlos Beltran 2-bagger in the bottom of the inning. Mookie Betts' sacrifice fly in the 19th off Esmil Rogers drove in what proved to be the winning run in what turned out to be a 6 hour, 49 minute affair, including a 16-minute delay when part of the lights went out in Yankee Stadium. Steven Wright got the win with a 5-inning relief appearance. He is expected to be optioned back to Pawtucket to make room for Joe Kelly. Boston jumped out to an early 1-0 lead in the top of the 1st inning off Yankees starting pitcher Nathan Eovaldi on an RBI single by Pablo Sandoval that scored Dustin Pedroia. 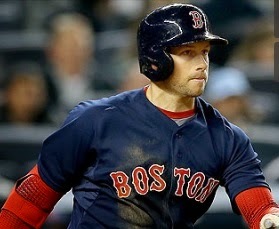 The Sox added a pair of runs in the top of the 6th when Daniel Nava (pictured) singled off the glove of first baseman Mark Teixeira to drive in Sandoval and Mike Napoli. Wade Miley made his first start for Boston going 5 very strong innings before giving up a pair of runs in the bottom of the 6th. He went 5.1 innings, charged with 2 runs on 4 hits and 2 walks while striking out 6. The Red Sox bullpen was tremendous - Robbie Ross, Alexi Ogando, Junichi Tazawa and Edward Mujica combined for 3.1 scoreless innings of relief - until Chase Headley tied the game in the bottom of the 9th with a solo home run off Mujica to tie the game at 3.